The two days of warm and dry official track time at Phillip Island were unfettered in terms of weather conditions but it was the high attrition rate of crashing riders and some technical issues that cut short the available track time from the first session to the last. 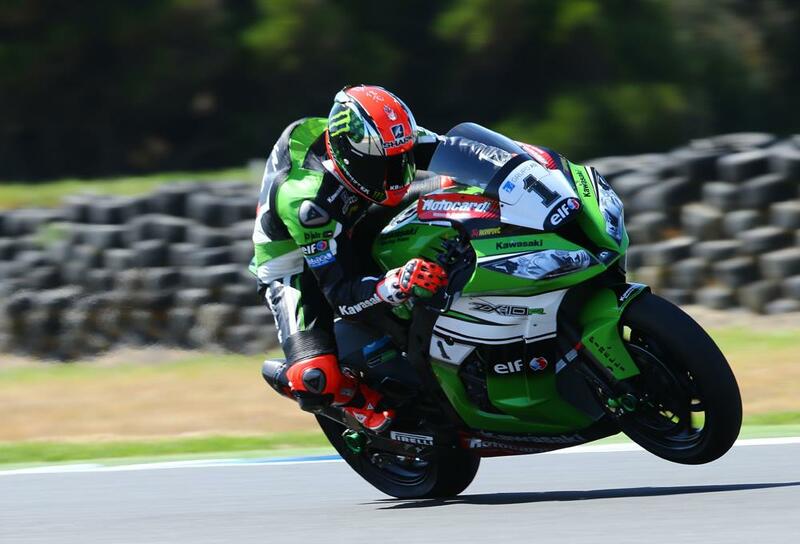 The fastest rider on show proved to be Tom Sykes (Kawasaki Racing Team) who pushed his way to the top thanks to a time set on the second morning, when track temperatures were cooler than the final afternoon. His 1’30.239 was tantalisingly close to the track best of 1’30.234, set by Carlos Checa last year in Superpole. Second fastest rider proved to be the cool headed Eugene Laverty who took his Voltcom Suzuki just ahead of his new team-mate Alex Lowes. Sykes being fastest was almost expected, but despite some great test results in Europe recently, few would imagine that there would be a Suzuki lock-out just behind Sykes. Marco Melandri (Aprilia Racing) was fourth, and the first Ducati was that of Davide Giugliano, fifth ahead of two-time faller Loris Baz (Kawasaki Racing). Sylvain Guintoli (Aprilia Racing) scored seventh. Even a massive highside could not hold Leon Haslam down, as he escaped with a bashed but not broken body, but he lost his last session and ended up eighth, one place ahead of his Pata Honda team-mate Jonathan Rea, who had struggled with the final three corners on each lap. The top ten riders were covered by less than a second, with Chaz Davies (Ducati Superbike Team) the tenth rider. The first of the Evo bikes was 11th, the Althea Ducati of Niccolo Canepa, as he was comfortably ahead of the next best Evo bike, the KRT Evo Ninja of David Salom, who finished 13th. Toni Elias (Red Devils Roma) was 12th, the factory sandwich between the top Evo bikes. Fabien Foret (Kawasaki Mahi Racing Team India Evo) was 14th fastest while the last spot in the top 15 went to the MV Agusta SBK bike of Claudio Corti. The best of the Buell riders proved to be Geoff May, who took his EBR1190 RX to a best lap of 1’34.807, more than four seconds from Sykes and the top runners in what was the American V-twin team’s first ever test. A gigantic amount of red flags were thrown across the two days of testing, and some big names got hurt due to the high speed nature of their crashes. Michel Fabrizio (Iron Brain Kawasaki SBK Evo), who fell yesterday, was kept in hospital as a precaution, despite X-rays revealing no signs of injury. Reigning STK1000 Champion Sylvain Barrier (BMW Motorrad Italia Superbike Team Evo) was diagnosed with a micro fracture in his pelvis. Luca Scassa (Pedercini Kawasaki Evo) fractured his pelvis in two places after his heavy fall, when his bike landed on him. Jeremy Guarnoni (MRS Kawasaki) suffered a dislocated left collarbone, and in Supersport Jack Kennedy (CIA Insurance Honda) broke the heel of his right foot and ended up having an operation on Tuesday afternoon.